Laundry is one of those tasks that doesn't lake a whole lot of energy, but is always being put off until later. According to epa.gov, the average family does 400 loads of laundry per year (thats 7.69 loads per week). If you keep putting off those loads of laundry, dirty laundry piles up and you wind up spending your entire weekend washing, drying, ironing, and folding. When it takes you that much time to do your laundry, you're bound to put it off again and again. The cycle continues. I speak from experience. Break the cycle! Learn ways to make your laundry chores quick and easy (and relatively painless). As soon as children are able, teach them the system. As they grow, they will be able to take care of their own laundry. Treat stains as soon as they happen. Place all socks belonging to one family member (even if it's just one pair) into a zippered mesh washer bag (also great for washing delicates). This will keep the sets together and you'll always know whose is whose. If socks for 2 different people are similar, write names on the bags or color code them. Be sure to always have a constant back-up of all your laundry requirements. If you always have a spare jug of detergent, dryer sheets or bleach, then when you open the spare, you know to add that item to your shopping list. This way you will never run out. Sort your laundry as you go. If you have the space, use a sectioned hamper in the laundry area. You can separate by color or by family member. You could also sort by type - laundry vs. dry cleaning. Be sure to let everyone know which bin or basket is for the dry cleaning. Buy as many hampers or laundry baskets as you need and put one in every room. If you need one in your bathroom, don't put it in your closet. Have one in each child's room and teach them to use it. For larger families, combine wash loads of family members whose clothing is very different - not only in gender, but also different sizes. You can easily tell whose clothing is whose when the entire load is made up of clothing for either your toddler daughter or your teenaged son. However, trying to sort clothes for two adult-sized men is not so easy. Again...I speak from experience. Liquid detergent can be used as a pre-treatment for some water-based stains. It takes approximately 30 to 50 minutes for a load of laundry to run through a full wash cycle in a top load machine. 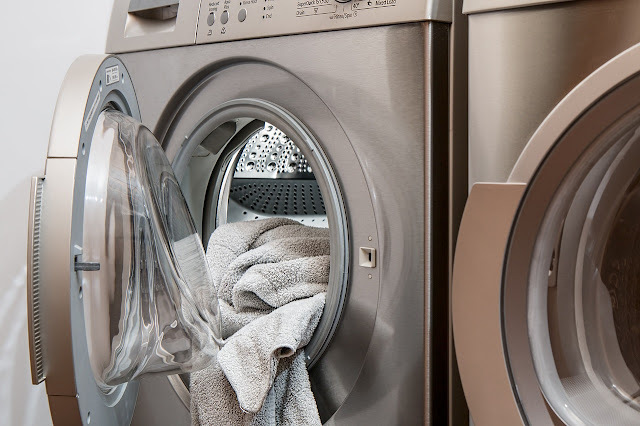 The time can be more for HE washers because of the lower water and/or energy use. Run a load of laundry while you are making dinner, watching your favorite television program, etc. A luggage rack can help save the strain of your back. This great item stands 20 inches off the floor so you can place your laundry basket on it and easily transfer your items from the dryer to the basket. The rack folds up flat when not in use and can be stored between your washer and dryer. Of course, you can use it as a luggage rack when guests come to visit, too. Keep empty hangers in the laundry area. When folding your clothes you can place items directly on hangers instead of having to first fold them, carry them to the correct room and then hang them. I installed a hanging rack in our laundry area to store hangers and to hang shirts fresh from the dryer.Mine came from IKEA but it is just like this one. Set aside items that need to be ironed. Assign one or two days a week to do the ironing (or however often it needs to be done). It makes more sense to pull out the iron and ironing board once for several items than to put it out each and every time you have one garment to iron. As you fold items, sort them into piles or baskets for each family member.